Most economic experts are in agreement that Turkey has been playing an increasingly prominent role in the world economy, redefining itself as an attractive hub for foreign direct investment (FDI). The country is regularly talked about alongside the economically strong BRIC nations and has accentuated its appeal to foreign investors thanks to its resilience during the recent recession. According to 2012 figures, global FDI inflows declined by 14 percent from 2011 to $1.4trn. High volatility in financial markets, macroeconomic uncertainties, the fiscal gap in the USA and euro crisis have all affected the slump in FDI. In 2012, the FDI projects volume in Europe shrank by 21 percent year-on-year as a result of the global slowdown. By contrast, Turkey expanded its market share and still ranked as one of the top 10 countries in Europe for FDI, with around $12.5bn in 2012 (see Fig.1). Although project numbers for the world’s top five industries decreased in 2012, some promising industries – such as natural resources and renewable energy – increased in number. As far as Turkey is concerned, the construction industry is the most booming sector. 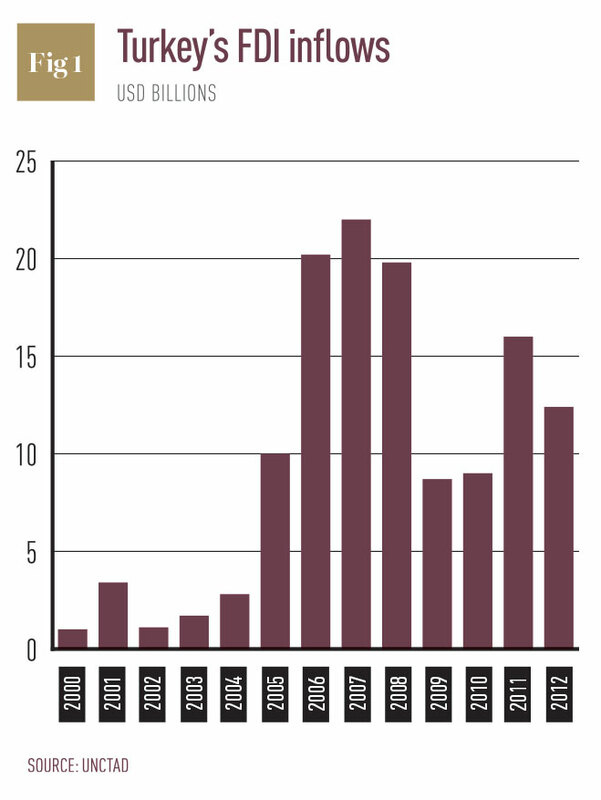 It produced $1.3bn in 2012; four times as much as in 2011. In parallel with global indicators, Turkey’s FDI inflows have dropped by 23 percent to $12.4bn, a figure dominated by the finance and insurance area (41 percent). Apart from the service sector, manufacturing is the leading industry, accounting for 27 percent of all inflows. FDI real estate purchases, meanwhile, increased by 31 percent to $2.6bn. The UK is at the forefront of foreign investment in Turkey, with around $2bn. Following the UK are Austria, Luxembourg and the Netherlands, which have each contributed around $1.3bn to FDI in Turkey. Sustainable growth, economic stability, and the improvement of laws and intellectual property rights have created an optimistic outlook for Turkey. The AT Kearney FDI Confidence Index moved Turkey up from 23rd place to 13th in 2012. Furthermore, the WEF Global Competitiveness Index ranked Turkey in 43rd position, whereas it stood at 59th in 2011. As an emerging market, the Turkish economy is driven by developed countries’ economic conditions. Current financial uncertainties in the US economy resulted in a predicted decline in FDI from that country. In line with these circumstances, a 35 percent downfall in FDI was observed in Turkey in the first five months of 2013. It seems certain that the financial and political instability seen in recent months have been instrumental in retarding the country’s growth this year; however, some large volume transactions are expected to conclude (particularly on privatisations) in the last quarter. In any country and in any economic system, political, legal and financial stability are indispensable in encouraging foreign investment. There are many factors at work behind the growth of FDI in Turkey, including the country’s geostrategic location and its young and dynamic population. However, these assets alone are not enough to attract foreign investors; you also need liberal legislation. Turkish financial reforms, which began in 2001, legal reforms made within the frame of EU candidature, and also new regulations in social security, have provided financial stability in Turkey. 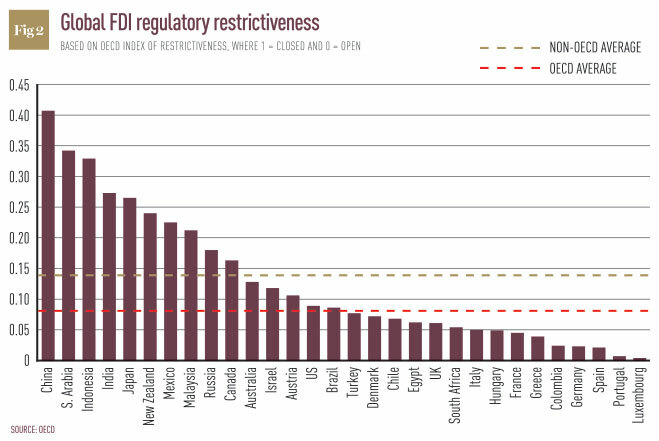 As a result of these reforms and bureaucracy minimisation efforts, a new FDI Code has been in force since 2003. This code provides a declaration-based system instead of a permission system. As a result, foreign investors do not have to obtain authorisation for the establishment of a company in Turkey. Moreover, the minimum foreign capital requirement of $50,000 has been abolished. Also, the new code does not require the establishment of limited liability or joint stock companies by foreign investors. In addition to these legal developments, committees for improving the investment climate have been in action since 2001. These aim to bring international interest to the investment climate in Turkey by gathering opinions from other institutions’ representatives. Beyond these factors, bilateral agreements are also a reason for the growth of FDI in Turkey. Bilateral agreements facilitate foreign investments in agreement parties. According to the statistics, Turkey has been a party to 84 bilateral foreign investment agreements as of 2012. Establishing a new company/branch or liaison office of a foreign company. Foreign investors are able to establish new companies even with one shareholder as either joint stock companies or limited liability companies. There is no restriction regulated by law about the nationality of shareholders, so they can be either foreign or domestic. Acquiring shares in a company established in Turkey (any percentage of shares acquired outside the stock exchange or 10 percent or more of the shares or voting power of a company acquired through the stock exchange). Assets acquired from abroad by foreign investors are capital cash in the form of convertible currency bought and sold by the Central Bank of Turkey, stocks and bonds of foreign companies (excluding government bonds), machinery and equipment, industrial and intellectual property rights. Assets acquired from Turkey by foreign investors are reinvested earnings, revenues, financial claims or any other investment-related rights of financial value, commercial rights for the exploration and extraction of natural resources. Foreign investors are able to transfer freely abroad: net profits, dividends, proceeds from sales or liquidation of all or any part of an investment, compensation payments, amounts arising from license, management and similar agreements, and reimbursements and interest payments arising from foreign loans through banks or special financial institutions. With the FDI Code, corporate income tax was reduced from 33 percent to 20 percent and there are tax benefits/incentives in technology development zones, industrial zones and free zones which could include total or partial exemption from corporate income tax, a grant on employers’ social security share, as well as land allocation. The indispensable corollary of investment confidence is the political expectation that investment will take place. Markets value not only economic but also political stability. In that regard, 2014 might seem to be a particularly important year in terms of the political agenda in Turkey. Turkish voters will go to polls to decide on country’s new president and the local elections will decide who is going to rule the municipal governments in Turkish cities. This might seem to be another addition to already burdened Turkish politics after the incumbent government’s decision to suppress the Gezi protests which had started over a controversial decision to build a new shopping mall modelled as a replica of an Ottoman army barracks on the site of a public park in Taksim square. However, the latest polls covering the period between 10-19 August 2013 suggest, despite the widespread protests for Gezi, that Erdoĝan’s AKP party still commands slightly more than 50 percent of the overall votes, which is more than enough for the resumption of single party government. What unites almost all of the political analysts from different political backgrounds, who rarely agree on anything, is that there is no serious and united opposition in Turkey that can challenge Erdoĝan’s rule. Even though the Kurdish issue is and has always been Turkey’s soft belly, expectations are running high that Erdoĝan might show resolve with regard to the peace process in exchange for the much needed support of the Kurdish opposition party BDP, to garner enough votes for the critical constitutional amendment that would transform the Turkish political system from a parliamentary to a presidential one. This would give Erdoĝan complete mastery of Turkish politics. Turkey will have local elections in 2014 and a general election in 2015, and is highly likely to witness the continuation of AKP rule, and the stable political situation that has lasted for more than a decade. And that is highly favourable for Turkish FDI.